Sidney Crosby sure picked a great time to snap out of his scoring slump. 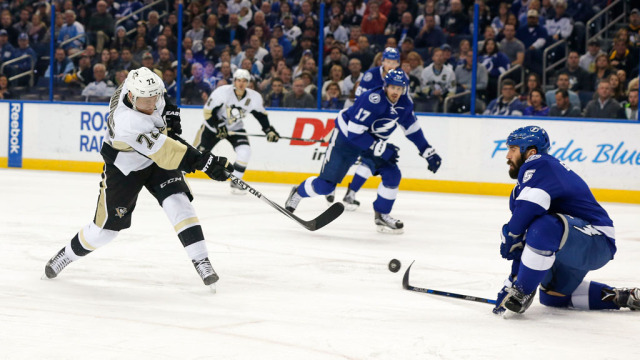 40 seconds into overtime, Crosby took a nifty pass from Bryan Rust and beat Andrei Vasilevskiy blocker side to give the Pens a 3-2 OT win and a 1-1 series tie with the Tampa Bay Lightning. They'll travel to Tampa looking to take back the home ice advantage with a Game 3 victory, and if they can continue driving possession at the same rate as they did in Game 2 they'll have the upper hand. The Pens posted a 61.2 SACF% against the Lightning, and some great play from Vasilevskiy and a pair of somewhat questionable goals by Matt Murray helped even things up on the scoreboard more than they were on the ice. They'll also have the upper hand against the Lightning if that Crosby goal is a sign of things to come. Crosby led the Pens in scoring with 8 points (3g, 5a) in the first round series against the New York Rangers, but he's managed only 4 points in the 8 games since. Along with Evgeni Malkin scoring 1 goal with 1 assist during that time frame, including no points in the past 6 games, Pittsburgh has been winning games despite of the lack of production out of their star centers. It's not a trend Tampa Bay can reasonably expect to see continue, and they've both been close to seeing the floodgates open. If the Penguins are able to see Crosby and Malkin take over games in addition to the play they're getting from their bottom 6, then they're going to be a tough team to beat. And that's because, unlike in years past, the bottom 6 is not only not dragging the team down, but it's been a more than capable compliment to the Crosby and Malkin lines. Matt Cullen continues to defy age, and his put back of a Vasilevskiy rebound early in the 1st period in Game 2 gave the Pens a 1-0 lead and gave Cullen his 4th goal of the playoffs after scoring 16 in the regular season. Phil Kessel pounced on a loose puck minutes later to extend the lead further. The former Maple Leaf was driven out of Toronto over the belief he couldn't be a productive piece for a championship contender, but as of now he's arguably Pittsburgh's top candidate for the Conn Smythe Trophy. Kessel leads the team with 14 points (6g, 8a), while Nick Bonino ranks 3rd with 11 points (2g, 9a) and Carl Hagelin is tied for 4th with 9 points (4g, 5a). - Not only did Sidney Crosby's OT goal break an 8 game goalless drought, but it's the first postseason overtime winner of his career. - Phil Kessel has an active 4 game point streak (3g, 3a) entering Game 3.